The ENOS ETX transmitter is the result of consistent engineering. During the development, we had the diver firmly in view and have set the quality requirements very high, so he stands up to the harsh everyday diving. The ENOS transmitter is only 20 cm long, has a diameter of only 3.5 cm and weighs only 165 grams with batteries! He has no influence on the buoyancy. 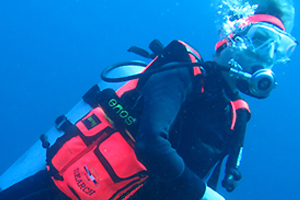 Using his bag, he can be conveniently attached to the diving equipment in various ways. As light as the ENOS transmitter is, its housing is so robust: no water ingress! This also contains the antennas, which avoids antenna breakage - this is unique in the world! The ENOS transmitter sends its signal every 20 seconds and the crew always knows the current position of the diver. If the diver is in a wave trough while the ENOS transmitter is transmitting, it is very unlikely that his signal will be received because the water wave absorbs ("swallows") radio waves. But 30 or 60 seconds later, the diver is on the crest and the ENOS signal can be received again. At his head sits an LED, which flashes regularly in use and is widely visible. This additionally increases security. It also displays the battery status and the operation mode during operation. To turn on the ENOS transmitter, his red foot is rotated 180 ° - that's it. No confusing buttons that are difficult to use with neoprene gloves (if any) ... That's why the ENOS transmitter is easy to handle, even with cold, numb fingers and even thick dry / diver gloves. After switching on, the asymmetric switch position clearly indicates "ON" (picture on the right) - important and reassuring in this stressful situation! After that he only has to hold up (photos above). This is important, so that the emergency call is transmitted without interference, because the water wave "swallows" / absorbs the radio wave. Immediately after switching on, the ENOS transmitter sends a 1st alarm to the ENOS receiver . Depending on how high the radio receiving antenna is mounted on board, the ENOS emergency call reaches up to 10 kilometers (5.6 NM). Why batteries instead of batteries? The ENOS transmitter uses lithium AAA batteries, which are available all over the world. The battery change can be made yourself, a return to us is not required! The notion that a diver drifts in the open sea with a transmitter whose battery does not have 100% power - even though he was charged the whole night - is a horror ...! Therefore, we will never install rechargeable batteries in our Seareq Rescue Transmitters - for your safety! The ENOS transmitters are supplied with lithium batteries, which have a capacity guarantee of 18 years ! This means that the batteries will reliably deliver full performance even after many years. A loss of performance is not to be feared and the load capacity does not need to be constantly monitored. The running time of the ENOS stations is 170 hours = one week! This is a world record among emergency transmitters, set up by our development engineers. He always has enough energy, even after several rescue operations, because ENOS missions usually last only a few minutes. When the batteries are to be changed, can be easily recognized by the flashing signals of the LED and is described in the manual.